AIPU 200GPM mud manager is designed for water well drilling rig that handle 200 gallans per minute mud flow to recycle drilling mud and re-mix for re-use. It is a 4 meters long mud tank install one set of double deck shale shaker to reach the application of mud recycling. 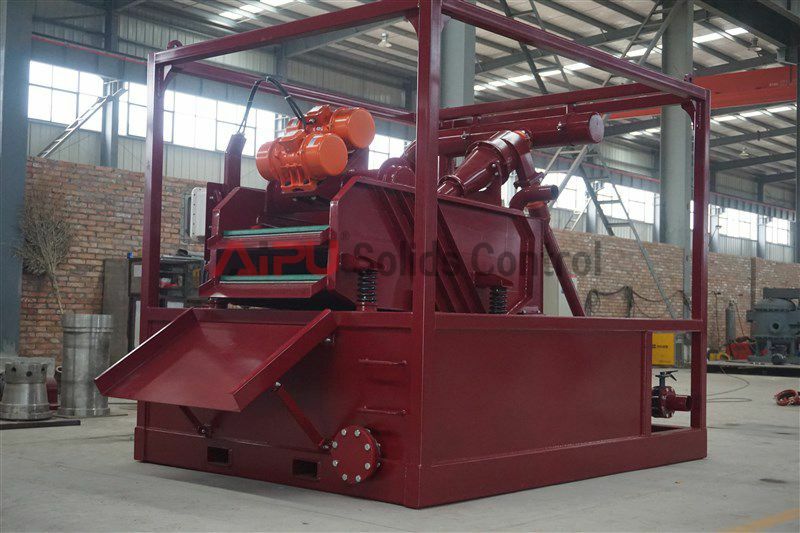 One set double deck shale shaker with 6 pcs of shaker screen totally , the bottom deck working for first phase cleaning at 400 microns separation , top deck working as a drying shaker for desilter cyclones for 20 microns separation . 6 pcs of desilter cone installed on double deck shale shaker for second phase cleaning and drop solids particals on top deck of shaker to reduce fluids lost . 1 set of centrifugal pump to feed desilter cone and supply proper mud flow and pressure for desilter cone for proper work . 1 set of centrifugal pump and 1 set mixing hopper to reach mud mixing application . 1 set of 4 meters long mud tank for 10,000 liters mud capacity , the mud tank devided into 2 compartments , the first one as a sand trap and second one as a mixing & storage application . Mud tank attachment and electrical control system for all above motors . Other than 200GPM mud manager, AIPU solids control supply a complete line of mud manager for different drilling rigs to suit different drilling conditions and regulations , further more talk is available by click website or call office directly .